then of course after i had it i craved it everyday, until i decided to try to make my own version, because i guess i can’t really go buy it everyday. so, here’s my own version that i made. it’s not dead on, but it will have to do..
place pecans in a small skillet over medium heat. toast pecans for about 10 minutes. 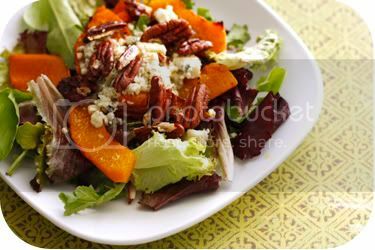 arrange salad putting down mixed greens, roasted squash, bleu cheese crumbles, toasted pecans, and some vinagrette. *you can also make your own simple vinagrette, this was just my lazy, easy way. the combination of flavors is awesome! enjoy! I was just tried this salad at Pizzeria 712 over the weekend and have been craving it ever since. Thanks for the recipe. I’m always torn between this one and the beet salad. So yummy! wow..good job. looks just like it. This is my favorite salad at P712!! I’m so excited to make it, thanks!